Well, I have been anxiously awaiting the release of this book. Therefore, it’s no surprise that once I was able to download it onto my Nook–thank goodness for the immediacy of e-readers–I devoured it in one day. Yes, one day. So let’s just get to it. When last we saw Gideon and Eva they were outside his apartment because Eva had just discovered–from the police–that Gideon had murdered her childhood abuser, Nathan. (This is not a spoiler because we knew this in Reflected in You.) Now that the cat is out of the bag for Eva and she understands Gideon’s actions in the last book, they can start the process of publicly coming back together. Of course, this can’t be done over night or further suspicion will be cast on Gideon. But the police seem to have a new suspect–someone from the Russian mob–and no, Gideon does not have Russian mob connections–but I wonder if Stanton does… Anyway, we have Brett–who wants Eva back; Corinne who is so desperate for Gideon’s attention she goes to extremes that bring Gideon and Corinne’s husband–the Frenchman–to blows while in a hospital. Not to mention the reporter that’s trying to ruin Gideon because of the way he treated their one night stand and can you say OMG to the curveball thrown in by Cary, Eva’s roommate? Plus, everything that happened to Eva as a child finally comes to light for her father–who never knew anything; bringing a showdown between him and Eva’s mother. There are so many story arcs in this one it’s not surprising I couldn’t put it down. In spite of that, I will say it wasn’t hard to follow and the way they were all weaved together–kudos to Sylvia Day for a job well done. Speaking of the many plot twists–SPOILER ALERT: I’ve heard rumblings that people are upset because this series was supposed to be a trilogy and the ending has a clear set up for the next book. My question: If you love the characters and story lines, why wrap them up in 3 books when they could go on and you could continue to engage with them? Personally, I loved this book so much more than Reflected in You–which I thought spent most of its time listening to Eva whine. I am looking forward to the next book in this non-trilogy and I am so happy that the author has decided to step away from that cookie-cutter approach a la Fifty Shades of Grey. 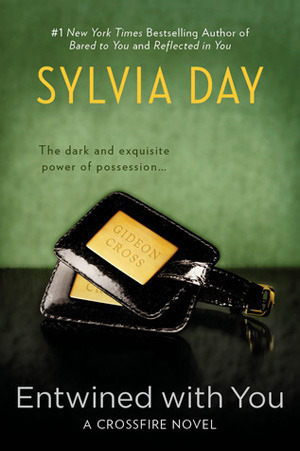 While on the subject of Fifty and books similar, I am very happy to have heard that Sylvain Reynard will be continuing the story of Gabriel and Julia. And as a writer myself, I am very happy for the author to be able to continue writing and publishing books for his, yes, his–did you not know that the Gabriel and Julia love story is written by a man?–audience to love. The next one comes out in December, I believe–can’t wait!